Below is a recipe that I originally came across on goodfood.com.au. I would have to say it is one of my all time favourite salads. It’s a little fiddly, but definitely worth it!!! Cook quinoa and lentils separately in boiling water until both just cooked, as per directions on packets. Mix the yoghurt, ground cumin, olive oil, lemon juice and honey until combined. Put to the side. 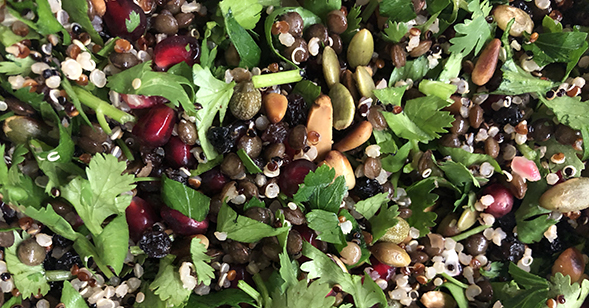 In a medium bowl, place the coriander, parsley, red onion, quinoa, lentils, toasted nuts, capers, currants and pomegranate. Mix well. Serve with a spoonful of yoghurt dressing on top. Salad goes great with grilled meat or fish.